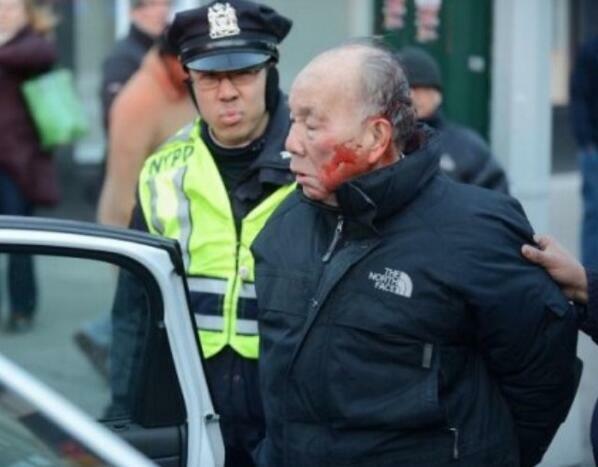 Kang Wong, 84, was jaywalking on New York City’s Upper West Side on Sunday when police stopped him and attempted to issue him a ticket for the time-honored infraction among New Yorkers. Not too long after, Kang was in the hospital then sent to jail. The New York Post reported Kang Wong tried to walk away during the ticket and didn’t speak English. “The guy didn’t seem to speak English. The cop walked him over to the Citibank [where the officer] stood him up against the wall and was trying to write him a ticket,” Fordham University law student Ian King, 24, told the Post. “As soon as he pushed the cop, it was like cops started running in from everywhere,” King added. Kang Wong’s son wen to the police station where he was held and apparently the cops were giving him the runaround not telling him what the charges were. “The cops are playing games. They won’t tell me what he’s being charged with,” the son initially told reporters. Ok this is going too far now, They are now beating our Grandfathers America! WAKE UP. Lets stop this before we loose our country for good. What a bunch of bully cowards to beat a old man. I bet those pud knockers couldn’t take anyone without help or a badge. This has gone way beyond criminal treason against our constitution of law. Wow, this is disgusting NYC cops! Beating up an old man who doesn’t speak English. Why don’t you focus on the real criminals or if you can’t handle it, get a new job.